It may be cold outside right now, but only a few short weeks till buds and blooms. Many goats are kidding already. As of today(3/12/19) we are almost caught up. 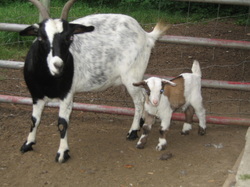 Right now we have 10 fainting kid goats available, though may still retain two, and 4 Svart Honas available. We have 4 gilts(girls). They are 5 months old and $50 each. 1 pure year old Kune Kune boar(intact) for $200(not registered) double wattled. We are also offering fresh goat milk kefir and cheese locally as well as shipping our extra milk kefir grains so you can make your own from your choice of milk. Taking deposits on future litters of Brussels Griffon pups, Goat kids, and spring Svart Hona(Swedish Black Hen) chicks/hatching eggs. Welcome to our farm's website. Our family has been living here for over 40 years now and though things might have changed, our love for the animals we raise, and appreciation for our land has not. We try to stay as self sufficient as possible and live off the land as much as we can. We do not use cell phones any more, as we feel they take too much time away from living life. We do use the home computer(as you can see...lol), but we would rather be outside instead. Yes, we use email and google voice(to save money on long distance calls and in order to to leave/receive text messages), but may be offline for many days between using the computer. We do not use any social media, so don't try to "like", or "follow" us. Whether you call us conservationist, green, traditional, farmers, hippies, hillbillies, or just plain unusual, we enjoy our lives and how we choose to live them. We hope you do the same. Perched on a hilltop overlooking a largely undeveloped countryside, we are located in northern middle Tennessee just below the Kentucky border near Gallatin, Westmoreland, Portland, White House, and Bethpage TN. Just a short drive from Nashville, Murfreesboro, Cookville, Clarksville, and Bowling Green KY. Farming has been a part of our family for generations. We have raised many different types of animals, and enjoy the fact that we can share some of what we love and live for with you. The breeds we chose to raise are better suited to homesteaders/small holders in general, but also enjoy the fact that they are unusual/exotic as well. They are healthier and better suited to free range management than stock more common to larger commercial farms . As long as we have our health and the ability to do so, we will surround ourselves with animals to share our love with. We no longer allow farm visits. We were robbed, and lucky enough to not be home or return home when it happened. Later on the sheriff did contact us to let us know they caught someone trying to pawn our guns...idots. This is how we figured out that they had actually came here to look at a couple of kid goats. We have since decided that we will meet people at a convenience store/gas station down the road with any animal in order to prevent anything like this from happening again. We would love to show off our farm, but understand that safety and security are more important. We hope you enjoy our site and are having a wonderful day.